The great thing about Hawaii is that each island is different from all of the others. Kauai is the oldest of the main Hawaiian Islands and thus has the densest rain forests, the deepest canyons, and the most stunning sea cliffs. It is nicknamed the Garden Isle and you'll see amazing flowers almost everywhere. It is also known as Hawaii's Island of Discovery and that's easy. There's so much to see and do around every corner. Kauai is also home to one of the wettest spots on earth - Mt. Waialeale which brings us to the first recommended activity for a first time visitor. If you ever take a helicopter ride in Hawaii, do so on Kauai. The majority of the most beautiful places, waterfalls, sea cliffs, and most of Mountain Waialeale itself can only be seen from the air. We recommend Jack Harter Helicopters but there are many other good choices. Jack Harter offers several different tours, but the best buy for your money is their 90-minute tour designed for serious photographers. It only runs once a day, so reservations ahead of time are a key. Helicopter tours won't fly in questionable weather. It's not safe, and customers would not get their money's worth. Reserve your flight for early in your visit so that if it gets canceled due to weather, you can reschedule. Kauai has some of the most stunning sea cliffs in the world. Don't miss your chance to see them from the water. From November through April you will even have the chance to see Hawaii's winter visitors, the humpback whales. One tour company that almost always receives positive reviews is Captain Andy's Sailing Adventures. They run both sailing and rafting expeditions along the Na Pali Coast. They sail from Port Allen Harbor on the south shore which is much more convenient for most visitors than one of the few remaining operators that leave from Hanalei on the North Shore. Now that we've covered seeing Kauai from the air and from the sea, there are a couple of things that are "must-see's" by land. The first thing that is a must is a trip up to the Waimea Canyon and Koke'e State Park. If you're staying in the Poipu area, you'll have a relatively short drive to Waimea and the trip up to the Waimea Canyon. This is, however, another trip that you'll want to make when the weather is clear over that part of the island since clouds tend to obscure the views of the canyon and the coast. Mark Twain called the Waimea Canyon the Grand Canyon of the Pacific, and it is amazing. The colors are actually much better than you'll see at the Grand Canyon. This trip can be done in half a day. The best views into the Waimea Canyon are in the early afternoon when the sun is shining on the canyon's eastern walls. 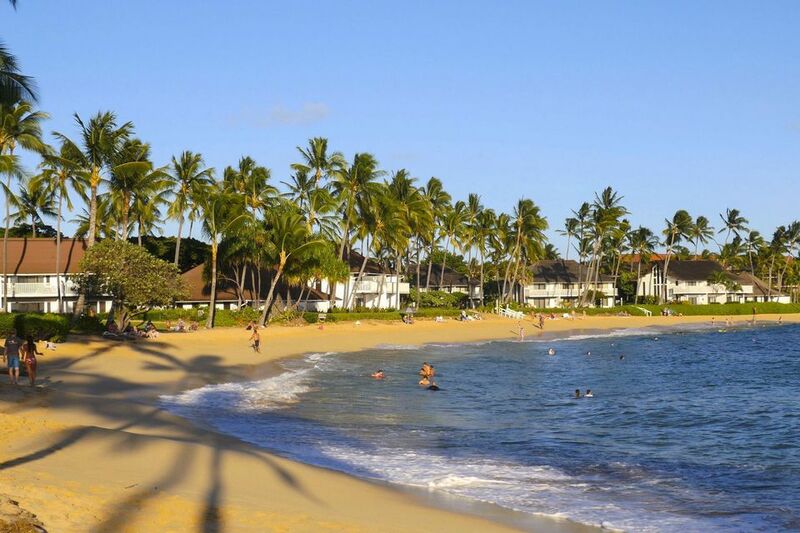 A great day trip if you're staying in the Poipu or Lihue areas is the drive to Kauai's North Shore. There is so much to see along the way. Heading north on Highway 56 from Lihue you'll pass the Wailua River. A trip down the Wailua River is a nice two-hour adventure that you might consider. Most first time visitors elect to take Smith's Fern Grotto Wailua River Cruise at some time during their visit. When heading to the North Shore make a left off Highway 56 onto Kuamo'o Road at the old Coco Palms Resort where Blue Hawaii was filmed. A bit up the road you can see Opaekaa Falls and a great overlook of the Wailua River Valley. From here you'll double back to Highway 56 and head to Kauai's North Shore.